Suddenly at this time of year th e English garden is transformed. The beds are full, flowers are everywhere, and there’s a scent of roses on the breeze. Even this year when the weather is completely unpredictable the magic is still happening out in the garden. I love roses, just love them, and especially heavily scented ones. Old fashioned roses are some of the most beautiful, but their beauty is short lived, they flower once and then they’re over. Here in my new garden I’m mostly planting new varieties that will repeat flower until the autumn, are disease resistant, but still have the scent and the flower shape of an old rose. One day they’ll fathom a way of publishing the scent, if only. To keep your roses looking good in summer, unless its the kind that has attractive rose hips in the autumn, dead head (take off all the dead flowers) as soon as you they start to go over and that will keep new flowers coming. Just cut back to a leaf bud with a sloping cut. And if you see any black spot on the leaves pull the leaf off and get it into the bin, not the compost heap. You need to get rid of the disease and out of your garden altogether. 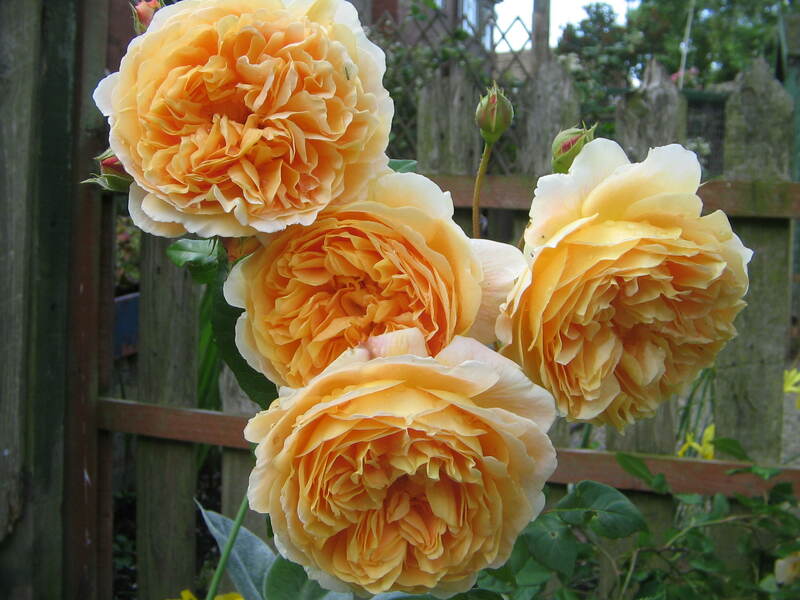 Other than that just weed around the base and get a good rose feed to give them a boost and keep them flowering throughout the summer. 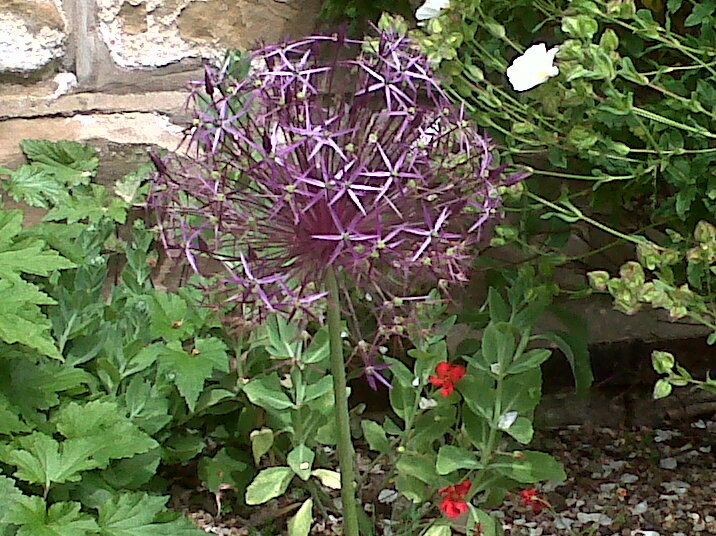 Of course there are lots of other amazing things going on – and allium christophii has to be one of the most amazing. Up it comes like any other allium on a tall stalk and then it opens and every year it makes me stop and stare. With a flower head around 8 inches in diameter and its shiny purple petals it glows when the sun shines on it. Order some for the autumn and sit back and wait. All alliums are easy to grow, like many bulbs you can almost put them in and forget about them. This weekend I’ve got lots of weeding and tying in to do, I’m going to try to keep away from the serious digging. The recent winds have knocked my roses about a bit so they need some support and the rain has brought on the weeds so they have to come out. Finally I have to get my broccoli planted out (again), the netting came off and the pigeons got the young plants so I’ll have to do it a bit better this time. May be then I can take a seat out there and enjoy! Believe it or not there is life stirring under all that snow. Spring bulbs amaze me, they fight their way through whatever the weather throws at them and make it into flower surprising us all. Of course if you were org anised (or planting in other people’s gardens as I was) the bulbs will have gone in over the autumn, but here in the new garden I have hardly planted a thing. I shoved a pot of grape hyacinths in because I saw they were sprouting, and I have some alliums in pots which I transplanted whilst they were still green last summer, but the lovely species tulips I’ve been collecting every year from Chelsea didn’t get very good treatment. As I should I dug them up after flowering and kept them in the garage. Then they came here and just sat in the shed until the week before Christmas, when I put two big pots together. But there are loads left. I must put them into compost as soon as it thaws otherwise we’ll have tulips in September, but that’s not looking likely any time now. 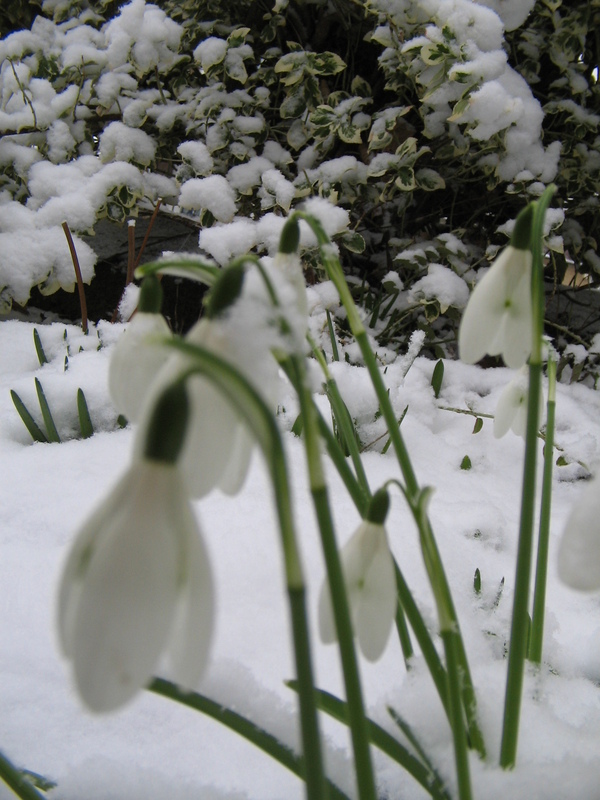 And if you’ve got some bulbs hanging around somewhere that you didn’t plant on time, never mind, just get them in. They might flower at slightly odd times, but they’ll sort themselves out next year. Very clever things bulbs. Christmas has gone and so the tree has been dismantled and put outside, poor thing. I bought a rooted one purposely because there’s nothing in the garden so it’s a perfect opportunity to plant a Christmas tree in the garden for years to come. 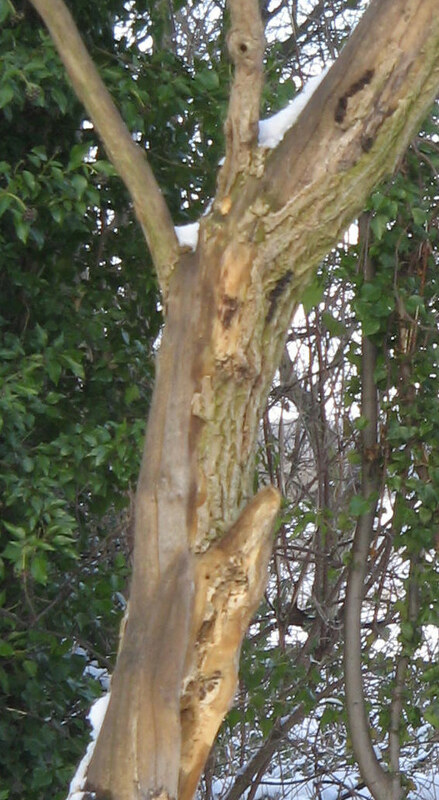 So now its gone from its former glory, although it was leaning slightly by the end of its stay indoors, and now is huddled against the side of the house. Really it would have been better with a bit more protection but there’s no room in the shed and the greenhouse has’t been erected yet. Well it’s so cold there’s no chance of me planting it yet, but I need to choose a spot where it won’t get too much shade from one side. That way it won’t lean towards the sun. Nor do I want it in a prevailing wind. 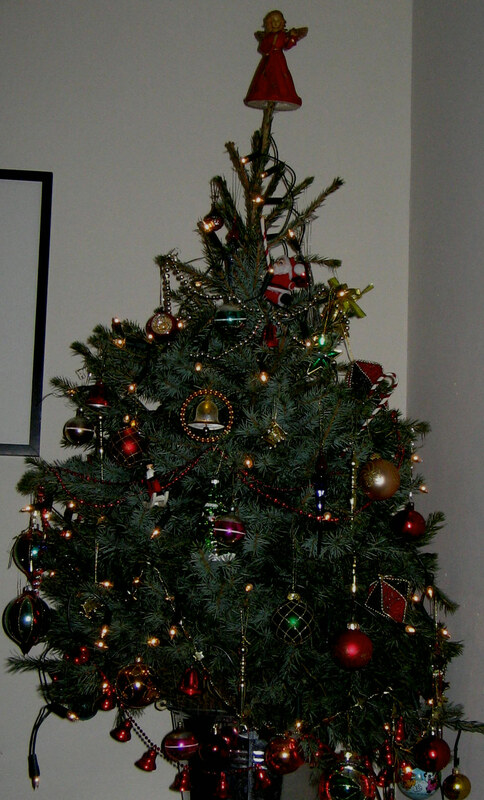 I want a straight gorgeous tree. This one looks very much like the traditional Norway Spruce (picea abies) but I’m sure it said it was Siberian on the label (before I threw it away!) so I’m not 100% how big it grows. Apparently the Norway Spruce can get to between 130 and 215 feet, according the the National Christmas Tree Association but only up to 130 ft according to the RHS – humm. 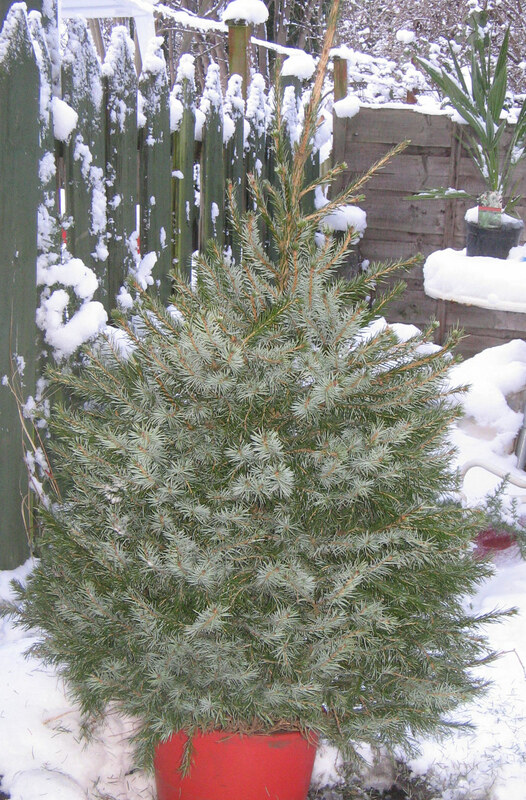 There are several varieties of picea abies though and I’ve no idea which one I have. Any ideas? 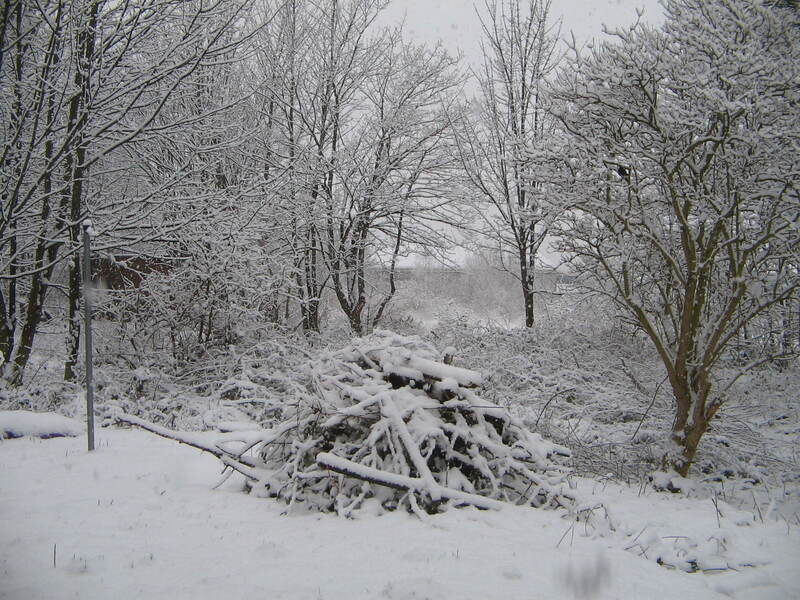 It looks just lovely out there, the white stuff has completely hidden the disaster that is my garden. So the only work that’s happened outside today is to clear the path to the door for the postman and to feed the birds again. They’ve been swooping down even though they did have an audience of cats peering at them from the window at one point. However, I discovered they don’t like olives. Please tell me they won’t do them any harm. I had some left from Christmas and they’ve been on the table for 3 days now and the birds were starving this morning and ate everything else – clearly not to British birds’ tastes! To make up for it whilst I was out I bought some proper bird seed to add to the crumbs and cheese they have been getting which got a much better response. One thing I did do was to the little conifers I have though and the bay trees. The weight of snow on things like confiers, cordylines and palms can do quite a bit of harm, breaking branches and getting things out of shape, so give them a shake. And I have a lovely yucca still in its pot which flowered wonderfully last summer, I can’t wait to put it into the garden in the spring and so I want to save it. 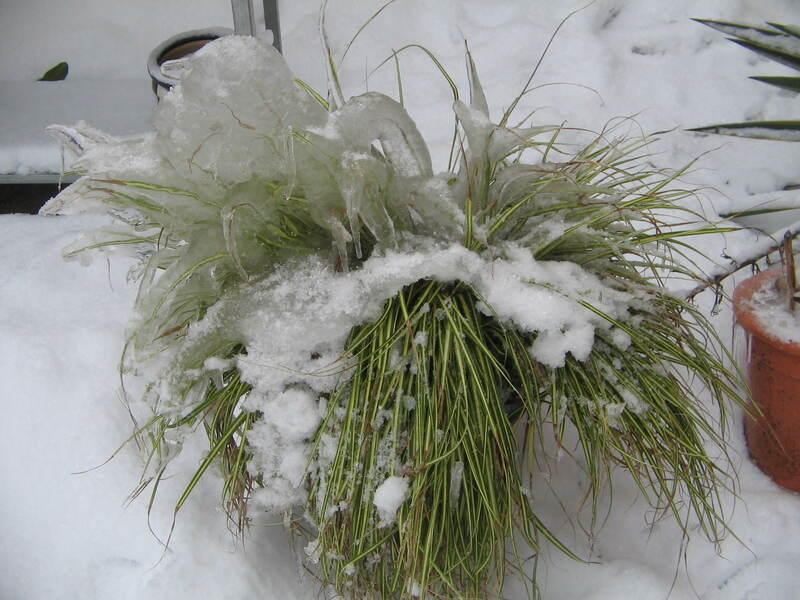 I’ve put the pot on its side so that when the snow thaws it’ll just run off instead of seeping into the middle of the plant and rotting it. 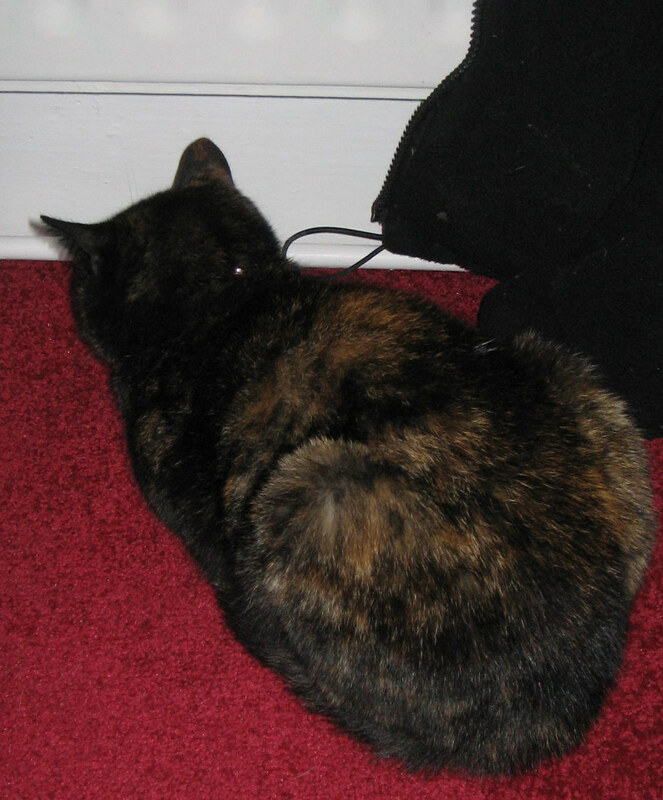 This is Lilly pictured this morning about 2 cm away from a hot radiator pipe. How she didn’t burn her nose I don’t know. She is positively disgusted with what’s happening outside and has shot in and out once only to my knowledge asking to be put out of the door where I cleared the snow rather than hopping through the catflap into the thick stuff. Her friend Mistle is upstairs and has taken over the bed – he too has not been seen to leave the house. Good news for the birds at least. Looks like the weather is staying like this for a few days so it’s unlikely much will get done, but at least I can think about it! If the sun comes out I might at least take some measurements and draw up a rough plan rather than working with the one in my head.